Can gamification change the world? – Go India, go future! Can gamification change the world? Some days ago I came across a social game trailer showing how a young girl from a developing country run across a huge number of difficulties to get a bucket of clean water and to carry it home as soon as possible for being able to get back at school. The ‘difficulty’ manager – of course – is the player him/herself who helps the girl to jump across barriers, to collect water drops and avoid contaminating “factors” during her walk. ‘Learning by doing’ – this could describe the concept behind. Which probably is not the worst idea to transfer knowledge and inform. Hygiene, waste of clean water, prevention. .. combined with emotional willingness to “make it” and being rewarded (although just virtually) it is entertaining, fun and stimulating. And there is no real risk behind. If you fail, you just get another try, another ‘life’ – which makes it easy and safe. Unfortunately, the reality is different. There are many hidden dangers, somehow also unconsciousness, time issues, simple constraints based on the daily life rhythm. We all do things as we always did – also in the rich countries, and also knowing about ‘side effects’. It is not that easy to change behaviors. And it might even be difficult to place this game to the right target group as their daily duties and infrastructures may not always allow to spend time playing an online game. However, the idea and concept behind is promising – a systematic approach which combines education, awareness building, fun and motivation. For a real change there is needed more than just playing, just knowing about it. Real willingness to change and strength and power to do so. People who become active and are able to promote and convince others to do so, too – against the big stream. This is certainly nothing, what a single social game can achieve. But it might help to raise awareness – and maybe, among all potential players, meet at someone who really feels engaged to do more and has the power to change. 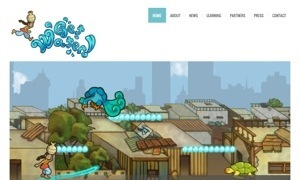 Want to know more on the water game?